Discussion in 'Houston Rockets: Game Action & Roster Moves' started by tinman, Aug 26, 2013. Better than the listed team, but not as good as the actual 2008-09 team with McGrady on it. Dwight is no Yao, and Ron was playing fantastic with AB scoring at will. Throw in a prime Landry and Scola... That's a good team. Too early to tell. If that team had a healthy T-Mac that would've given us a serious shot at the title. Potentially we can be better. As of today are we a better team? absolutely not. If that 08-09 team were healthy they would have crushed today's team. all those dudes were tough and hearty guys. none of them had egos, except for maybe Ron ,but Ron was real. 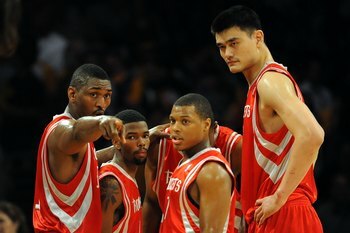 those were hard workers, grinders and of course Yao. let's not forget (for those who remember) that Aaron Brooks was stellar in the playoffs. That is what made Lowry such a beast on the boards for a pg. he signed a 1 year deal with the rockets and he gave us his all. he was brought in to be the 'third star' but became the 2nd star and a leader and mentor to his young team. he was free agent and not obligated to be with the Rockets. plus a season without yao? Ron averaged 15.6? i remember he average close to 17.
this is why on clutchfans we always have LINKs to our sources. you realize that's the wrong season. he averaged 12.7 during that 09 season. you are looking at the 10 season.